Today, the Internet has totally transformed the way people buy products and companies sell their products. From mobile phones to computers, clothes to shoes, books to electronics, people are increasingly turning to Internet to purchase products and services. This has resulted in the evolution of innovative ‘dot-com’ companies and eventually creative jobs. E-commerce popularity is not limited to developed countries. As with computer literacy rate, PC ownership, Internet users and Internet penetration rate, the Indian market is developing similar to American or European markets in growing popularity of e-commerce. This article analyzes and lists the factors that led to exponential e-commerce growth in India and discusses on how it is creating many new jobs. Few years back, using Internet in India was like using high-end technology, only available to those who can afford a personal computer and high Internet rates. Today, the scenario has completely changed. With reduction in PC and broadband rates, the number of Internet users has grown exponentially in the past 10 years. From just 14 lakh in 1998, the number of Internet users has grown to 12.1 crore in 2011 and is expected to reach 37.6 crore by 2015. E-commerce in India is still in its budding stage. But if we look at the trends in the consumer behavior, we can expect a lot to happen in online space in the coming years. According to Zinnov report, shopping is the third most popular category of search on Internet. While 77% of the respondents shopped online at least once in 3 months, over 50% shopped at least once in the last month. 83% of the respondents forecast an increase in online purchases. As increased number of people are showing interest in online shopping, investors find it a worth investing in India. According to Forrester report, the current e-commerce market in India, is US $ 1.6 billion (~8800 crore) and it is expected to grow five times by 2016 to US $ 8.8 billion (~48400 crore). Many companies in India have already entered online arena and tasted success they never imagined. Indian railways web portal – IRCTC; online bus booking services like Red Bus; online job portals like Naukri, Monster; movie booking, matrimonial services, etc., are a few portals that became big hit in India. IRCTC received 55.6 lakh bookings in April’12 compared to 22.6 lakh in April’11, achieving a growth rate of 146% in a year. With as many as 12 crore people using Internet, advertisers find Internet a worth pursuing space. According to IAMAI, as of March’12, digital advertisement spend in India was Rs 2,851 crore and by the end of 2012 it is expected to touch Rs 4,391 crore. On an average the digital ad spends are growing at 25% year-on-year. Further, in countries like US, UK, Canada, etc., e-commerce is already an established market and the use of SEO and SEM techniques has been in practice from many years. 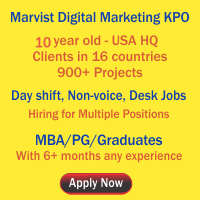 Offshoring digital marketing needs to India have started. Many companies in India already started outsourcing digital marketing services and as the demand increases the number of companies will also increase. As the field has demand at both national and international levels, we can expect decent number of career opportunities in this field. Very recently, NASSCOM made an announcement that it is going to promote Indian e-commerce and digital advertising companies in US and European markets. This, itself shows the seriousness of the opportunity in the field of e-commerce. With e-commerce emerging as a profitable market, companies are increasingly using Internet marketing strategies to gain competitive advantage. In order for them to stay on the top of the search engine results, adopting SEO (Search Engine Optimization) and SEM (Search Engine Marketing) techniques became highly essential. Without doubt all the above point to a huge demand for digital marketing professionals. Since this is highly specialized and requires fairly complex skills, it is likely that the digital marketing needs will be addressed by specialized service providers. Whether companies opt for using outside digital marketing firms or in-house digital marketing professionals is difficult to predict now. Probably, it does not even matter, what is important is that there is a tremendous need for digital marketing professionals right now and in the immediate future. So for all those who want to have a stable career for the next 10-15 years, a career in digital marketing would be the best choice as the scope of opportunities and career development seems to be high. This entry was posted on Jul 2012 at 10:21 PM	and is filed under Careers, Marketing Jobs in Hyderabad > MBA Marketing Jobs > SEO Jobs. You can follow any responses to this entry through the RSS 2.0 feed. Your Feedback Matters! Good job role is needed to maintain enthusiasm for your career. That’s whats gr8 about Digital marketing careers.